In this section we feature ideas that we think are particularly trendy. For example, aronia berries are the new super berry—so we developed a recipe for Aronia Berry Jelly that you are sure to love. 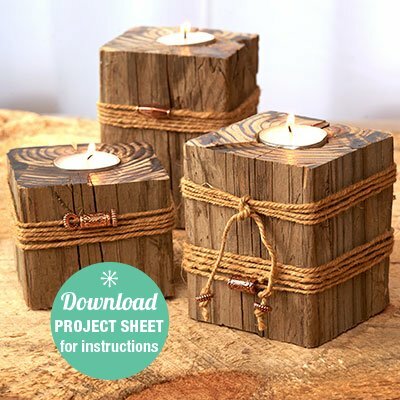 The rustic look continues to be popular and we love these wood post candles! What trends are you loving? Aronia berries, are becoming sought after for their amazing hearth benefits. The Aronia berries has been known as a “superberry” in recent years. The little berry is a power house of antioxidants. We combined it with blueberries and cranberries for one of the best jellies you have ever tasted! If you don't want to process the jelly, just keep it refrigerated for up to 3 months. No worries—it will be gone long before that! 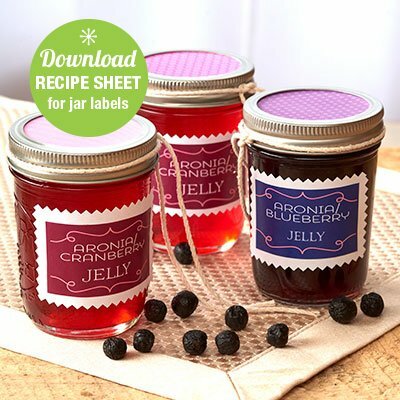 Be sure and download the Recipe Sheet, above, so you can print and add labels to the front of the pretty jars of jelly. 1 Place berries, apple, and zest in large saucepan and cover with about 4 cups of water. Cook until berries and apple are soft, about 10 minutes. Strain the mixture through a fine sieve. Juice should measure 4 cups. If not enough juice, add water to make the 4 cups. If too much, save remaining juice in refrigerator. 2 Pour the juice and lemon juice into a 6- to 8-quart heavy kettle. Sprinkle with pectin. Let stand for about 2 minutes, then stir to dissolve. Bring to a full rolling boil over medium-high heat, stirring frequently with large metal spoon. Stir in sugar. Return to full rolling boil and boil for 2 minutes, stirring constantly. Mixture will foam up while boiling. Remove from heat and quickly skim off any foam with metal spoon. 3 Ladle at once into sterilized half-pint canning jars leaving a 1⁄4-inch head space. Wipe jars and adjust lids. Process in a boiling water canner for 5 minutes, starting the timing when water returns to a boil. Remove jars and cool on racks until set. Attach label with double-stick tape. 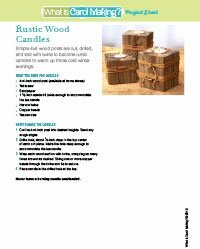 Simple 4x4 wood posts are cut, drilled, and tied with twine to become rustic candles to warm up those cold winter evenings. The "rustic look" is so popular right now and often uses reclaimed pieces of wood or metal. We used twine on the wood to keep the colors all in the same color palette. Download the Project Sheet at top of this page for instructions. 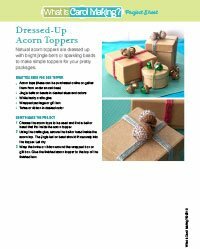 Natural acorn toppers are dressed up with bright jingle bells or sparkling beads to make simple toppers for your pretty packages. I love to pick up acorn caps and use them this way. Download the Project Sheet at top of this page for instructions.